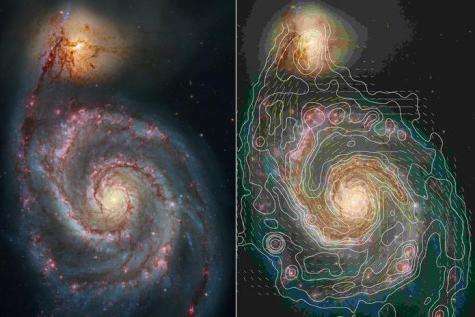 Magnetic field data from the Whirlpool Galaxy, M51. Credit: MPIfR Bonn. The mention of cosmic-scale magnetic fields is still likely to met with an uncomfortable silence in some astronomical circles  and after a bit of foot-shuffling and throat-clearing, the discussion will be moved on to safer topics. But look, theyre out there. They probably do play a role in galaxy evolution, if not galaxy formation  and are certainly a feature of the interstellar medium and the intergalactic medium. It is expected that the next generation of radio telescopes, such as LOFAR (Low Frequency Array) and the SKA (Square Kilometre Array), will make it possible to map these fields in unprecedented detail  so even if it turns out that cosmic magnetic fields only play a trivial role in large-scale cosmology  its at least worth having a look. At the stellar level, magnetic fields play a key role in star formation, by enabling a protostar to unload angular momentum. Essentially, the protostars spin is slowed by magnetic drag against the surrounding accretion disk  which allows the protostar to keep drawing in more mass without spinning itself apart. At the galactic level, accretion disks around stellar-sized black holes create jets that inject hot ionised material into the interstellar medium  while central supermassive black holes may create jets that inject such material into the intergalactic medium. Within galaxies, seed magnetic fields may arise from the turbulent flow of ionised material, perhaps further stirred up by supernova explosions. In disk galaxies, such seed fields may then be further amplified by a dynamo effect arising from being drawn into the rotational flow of the whole galaxy. Such galactic scale magnetic fields are often seen forming spiral patterns across a disk galaxy, as well as showing some vertical structure within a galactic halo. Similar seed fields may arise in the intergalactic medium  or at least the intracluster medium. Its not clear whether the great voids between galactic clusters would contain a sufficient density of charged particles to generate significant magnetic fields. 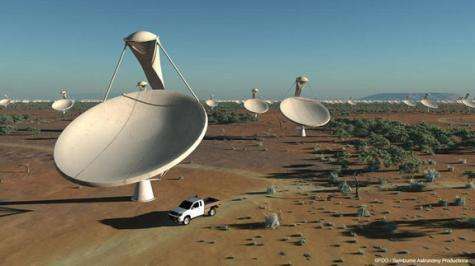 It is anticipated that next generation radio telescopes like the Square Kilometre Array will significantly enhance cosmic magnetic field research. Credit Swinburne AP. Seed fields in the intracluster medium might be amplified by a degree of turbulent flow driven by supermassive black hole jets but, in the absence of more data, we might assume that such fields maybe more diffuse and disorganised that those seen within galaxies. The strength of intracluster magnetic fields averages around 3 x 10-6 gauss (G), which isnt a lot. The Earths magnetic fields averages around 0.5 G and a refrigerator magnet is about 50 G. Nonetheless, these intracluster fields offer the opportunity to trace back past interactions between galaxies or clusters (e.g. collisions or mergers)  and perhaps to determine what role magnetic fields played in the early universe, particularly with respect to the formation of the first stars and galaxies. 	Optical light is partly polarised by the presence of dust grains which are drawn into a particular orientation by a magnetic field and then only let through light in a certain plane. 	At a larger scale, Faraday rotation comes into play, where the plane of already polarised light is rotated in the presence of a magnetic field. 	Theres also Zeeman splitting, where spectral lines  which normally identify the presence of elements such as hydrogen  may become split in light that has passed through a magnetic field. Wide angle or all-sky surveys of synchrotron radiation sources (e.g. pulsars and blazars) allow measurement of a grid of data points, which may undergo Faraday rotation as a result of magnetic fields at the intergalactic or intracluster scale. It is anticipated the high resolution offered by the SKA will enable observations of magnetic fields in the early universe back to a redshift of about z =5, which gives you a view of the universe as it was about 12 billion years ago. iwonder what part these fields play in galaxies formations and colligions ? Sadly, for most people, complicated ideas can't be made simpler and simpler without losing touch with reality. Look at it this way. The Earths magnetic field strongly affects particle trajectories in regions on the order of hundreds to thousands of miles. Intra cluster fields are roughly a million times weaker, so they affect trajectories very strongly on the order of hundreds to thousands of millions of miles. A single light year is measured in trillions of miles. So these types of fields could have enormous effects on the accumulation or dispersion of ionized gases particularly on the scale of a cluster, sizes of which are typically measured in millions of light years. That'd be something if the electric universe turned out to be correct. Aww c'mon 'skeptiks', aren't-cha gonna 'pooh-pooh' this obvious difficulty for speed of light dogmaticists.....? At least come up with some more contorted fabrications of obvious observational phenomena a la Ptolemy so we simple folk will not entertain doubt of over a hundred years of relentless propaganda. Einstein himself in his original publications of his books....the theories had extra terms since left out in releases meant for 'public consumption'.....and no true vacuum has ever existed in any of our labs nor in true interstellar space...we can only approach it....and so called lightspeed does vary according to traversed media! I hope the next generation of radio telescopes will be able to map magnetic fields. MarcelF: There is no need for dark matter or dark energy. If you want to get really wild, you may find out that there is no need for neutron stars or black holes either. They're all just modeled fabrications made to patch holes in theories that otherwise cannot match observed reality. And they're actually not necessary. Actually, neutron stars have been observed, and black holes were first predicted by theory. All theories are fabrications without experimental validation. The mention of cosmic-scale magnetic fields is still likely to met with an uncomfortable silence in some astronomical circles and after a bit of foot-shuffling and throat-clearing, the discussion will be moved on to safer topics. But look, theyre out there. They probably do play a role in galaxy evolution, if not galaxy formation and are certainly a feature of the interstellar medium and the intergalactic medium. This is such a great travesty. Far too often I hear that magnetism is irrelevant. Actually, no they haven't. Not once. What has been observed are various effects which have been attributed to neutron stars as having been the source. And to save you the time, yes, I'm including pulsars in that statement. I'm not sure what you mean when you say that black holes were first predicted by theory, when I'm saying is all they've ever been is predicted by theory. We might be in violent agreement here, except that I'll carry it further and state that they're not real. Careful with that "sound theoretical support"... If you look closely and carefully, the mainstream's standard models fall apart. That's probably why they're so scared of the heretics. I'd also argue that the real sound theoretical - as well as experimental - evidence is on the side of those who consider black holes et al balderdash. But don't take my word for it (not that I have any worries along that line)... Explore for yourself open-mindedly - and by open-mindedly I do not mean "abandon scientific principles and chase after hokum", no quite the contrary, I mean adhere to those scientific principles stringently, and then don't dismiss the actual results you find. Lucky me - and I had nothing to do with this, I really mean it when I say "lucky me" - today's TPOD is at least tangentially on topic, and certainly relevant to many of the above comments regarding dark matter. Feel free to check it out because author Steven Smith sums it up so much better than I can. The competing (mainstream) assumption, however, has the advantage of sound theoretical support. Magnetic fields on such a large galactic scale is actually a major obstacle against producing a coherent big-bang theory for the existence of sprial arms in galaxies. Those spiral arms are winding up way too fast for any kind of billions of years theory to be applied. At most you have something like 1.3 Ga before the spirals get meshed into un-recognizable clouds of stars. So since those spiral arms are still out there, it's not possible to categorically apply the "fact" of galaxies being billions of years old. Those pesky magnetic fields make it even MORE difficult to account for the existence of the spiral arms after the supposed evolutionary billions of years. They are however, an even stronger testament to the fact that the universe was made by the Creator and definitely not according to man's un-wisdom. I remember hearing that Tesla had an electrical theory of gravity that he claimed would trump Einstein's general/special relativity but I haven't read what his ideas were. Anyone know what was going on in his mind? Anyone know what was going on in his mind? He was excessively boastful and was creating abject lies towards the end of his life. I would take anything theoretical from Tesla with a grain of salt. ". . .all magnetic fields encountered in nature are generated by circulating currents." -With a great big hat tip and many thanks to "DustyDevil"